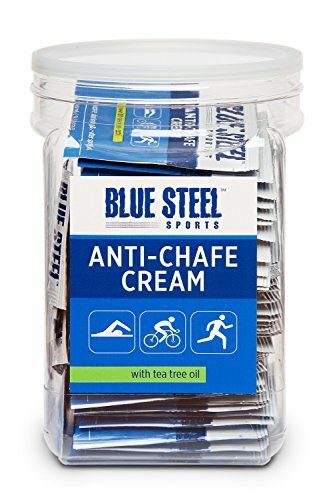 Blue Steel Sports Anti-Chafe Cream is an effective silicone based cream specially formulated for endurance athletes to protect against blisters, skin abrasions and saddle sores. It forms a thin layer to shield your skin against friction and moisture (sweat, rain and water) during extended activity. Long lasting; it won't sweat off so you can go for longer before having to reapply. Use before sports for prevention, and afterwards for skin recovery and maintenance. Highly recommended for multi-day events. Has Australian Tea tree oil which is naturally anti-septic and anti-fungal, and reduces the possibility of infection. Great for female cyclists - feels good on the skin; stays in place; no unwanted burning or tingling. Recommended for all active sports including cycling, running, walking, hiking, and swimming. Wetsuit safe, and great for triathletes! Not sticky or greasy, and washes completely off skin and out of chamois and clothing so there is no lingering odor. Blue Steel Sports. Be Active. Be Comfortable. If you have any questions about this product by Blue Steel Sports, contact us by completing and submitting the form below. If you are looking for a specif part number, please include it with your message.